"Our mission is to build out the most advanced social cloud," said Aaron Levie, cofounder and CEO of the California-based company, in an interview. "We want to make sure we can deliver no matter what your security, compliance or data-residency requirements." Countries have different requirements for the treatment and storage of data, resulting in a complex landscape. Delivered through partnerships with Amazon Web Services and IBM Cloud, Box Zones essentially allows companies to store data in the location of their choice. When the paid feature was announced in April, the first non-U.S. 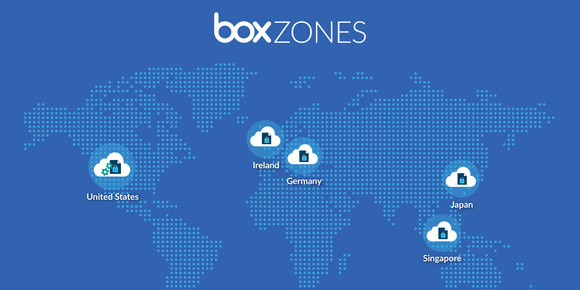 Box Zones were in Germany, Ireland, Japan and Singapore. Tokyo and Germany were particularly important growth areas for Box to address with the service, Levie said, given the sophistication of the business environments there and the presence of numerous multinationals. Demand in Canada and Australia has been growing rapidly, however. "This will be a major accelerant to our growth in those regions," he said. Roughly half the activity on Box is from non-U.S. users, though the proportion of revenue deriving abroad is smaller, said Levie, noting that many of its U.S.-based customers use Box internationally with customers and partners. The company claims more than 62,000 corporate customers, including 59 percent of the Fortune 500. Box competitor Dropbox has also been wooing international customers, including establishing regional data centers in Europe. But Box is building for a more diverse landscape, Levie said. "We built Box Zones to be able to work with Amazon, IBM, or even future cloud providers," he said. "We want to be the service than runs on top of the infrastructure service providers." In the meantime, the new Privacy Shield framework just recently took effect in Europe, altering the global landscape yet again. "Our tech philosophies don't necessarily relate to how privacy laws are enacted," Levie said. "Our mission requires that we solve the problem regardless." Further strengthening its global credentials, Box also announced on Wednesday that it has achieved compliance with ISO 27018, the international standard for protecting personally identifiable information in the cloud. A significant speed boost for the Box Accelerator global data-transfer network, meanwhile, should make using Box faster. Accelerator routes Box customer traffic so as to find the fastest path from end users to Box from anywhere in the world. With the enhancements announced on Wednesday, it now has network endpoints in more than 20 countries and 60 global locations, providing customers with upload speeds that are two to six times faster than before, depending on location, Box said. Australian users, for instance, will see average upload speeds that are four times faster, while those in the U.K. will see speeds triple. The new Australian Box Zone will become available this fall, while the Canadian one is due later this year; both will be powered by AWS.